As thousands of visitors flock to the Skagit County Tulip Festival in northwest Washington this April, a new award-winning roundabout near Mt. Vernon at Pioneer Highway and Fir Island Road will provide a safer and less-congested route for travelers. Prior to construction, temporary traffic control personnel were necessary to direct traffic at this intersection during festival season, but not anymore. GeoEngineers provided geotechnical consulting services for the roundabout project as a subconsultant to Reid Middleton. The project recently received two state awards, an American Public Works Association Washington State Chapter (APWA-WA) project of the year award and an American Council of Engineering Companies (ACEC) Washington silver award in the category of Social, Economic and Sustainable Design Considerations. The project had an aggressive six-month schedule to reconfigure two closely spaced intersections into a single lane roundabout. 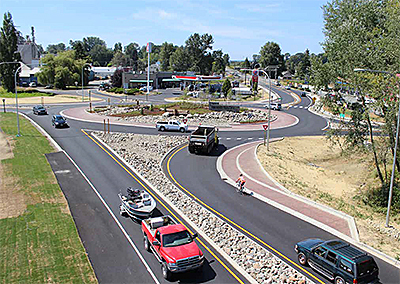 The project team considered many factors when designing the roundabout, including adapting to right-of-way constraints and accommodating oversized vehicles and large agricultural equipment. In addition to eliminating the need for temporary traffic controllers, the primary social benefit of this roundabout has been a 75 percent reduction in vehicle conflict points, with the most serious types of conflicts (left-turn and head-on collisions) completely eliminated. The roundabout has also improved access to local businesses and created an orderly circulation route through the adjacent parking lots.